The VMS offers some of its learning facilities to all individuals with visual impairment or low vision, even if they are not students of the school. 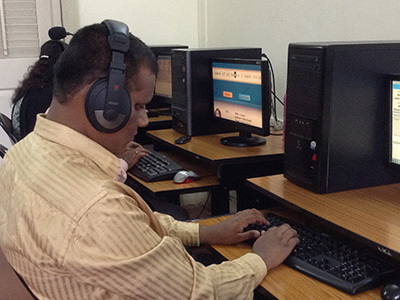 The VMS Centre for Computer Education uses specially designed technologies to help visually impaired people master computer literacy. With the help of advanced software like JAWS (Job Access with Speech) – that incorporates sounds and audio instructions to guide students through various programmes – the computer centre provides a platform for students to acquire skills that enhance their employability. Contributions from individuals like you help us provide and sustain such learning facilities for students without sight. The VMSB Library and Resource Centre offers learning tools such as books in Braille, computers with special-access software like JAWS, audio CDs on various subjects and recreational music. It is a whole new world of learning and fun offered to any individual with visual impairment or low vision, even if they are not students of the school. The Centre also has printed books, CCTV reading devices with magnifiers for members with partial sight or low vision as well as special equipment that converts printed study material into Braille. The Centre is supported by donors like you and a dedicated group of volunteers who contribute their time and efforts to read for the members, provide guidance beyond the classrooms and also help them submit online application forms for advanced courses outside the school. The centre also organises talks and workshops to help build the morale of the students and guest members. One of the several vocational training facilities offered at the VMS is the massage therapy training. A three-month course, specially designed for adults with visual impairment, is conducted by qualified and experienced masseurs. The course covers therapeutic massages and basic reflexology. The students’ skills are further honed through practical application of the training. This course has been one of the most successful vocational training programmes with several of our students receiving employment at salons and spas in luxury hotels such as Birla Care, The Taj Lands End, MIG Club in Bandra and the airport. Several have begun their independent massage businesses with a dedicated list of clients. Thanks to training programmes such as this, individuals who were once held back by their visual impairment are today self-reliant, financially secure and confident citizens. One of the initiatives by VMSB that help individuals with visual impairment or low vision create a stable future for themselves is the Competitive Coaching Classes provided at the school. The classes, offered to all such individuals across the city, help them prepare for 45 different government exams in sectors like Banking, Insurance and Railways. Since its launch in February 2016, these coaching classes have been offered to 37 students with visual impairment. We believe that professional quality training better prepares these students for the competitive exams, which in-turn helps them secure good government jobs and a stable income. The competitive coaching classes are just one of the means of ensuring children with visual impairment are empowered to become independent and contributing members of society.